An elbow injury doesn’t have to put you out of commission forever, but it does require elbow injury treatment. Visit the experts in Midtown Manhattan to prevent further complications and get back into your game as soon as possible. A repetitive motion disorder that causes elbow injuries may force you to revise the way you do certain activities or replace your outdated equipment. Either way, your elbow tendon injury treatment in NYC comes with homecare instructions that you must follow to fully heal. Come to our sports injury clinic to get your pain evaluation and treatment. 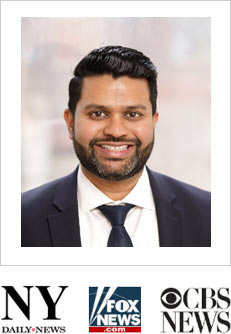 Meet our elbow pain doctor Febin Melepura M.D. to get the pain relief you need in the safe, reassuring hands of the best sports pain management specialists in NYC. Mobility issues and elbow pain are common when you get an elbow injury. Don’t assume your elbow will get better on its own. Whether the damage occurred as the result of an accident or a repetitive motion disorder, you need to rely on an experienced, talented team of sports medicine and pain management experts in Midtown Manhattan for elbow injury treatment. Your elbow is made up of many small, interconnected parts that come into play in your life every single day. Ligaments, cartilage, bone and fluid make up your elbow joint, and all are potential victims of damage and overuse. If you’re like most people, you take your elbows for granted. 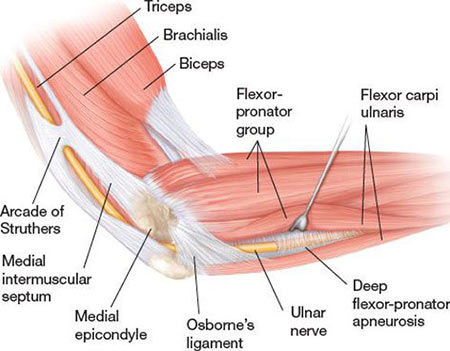 But elbow tendon injury treatment isn’t just common among athletes and physically active workers. Tennis elbow injuries result in lateral epicondylitis — tiny tears in the ligament that attaches your forearm muscles to the bone on the outside of your elbow. It’s a muscle strain injury and repetitive motion disorder. The pain that comes from a tennis elbow injury usually results in weakness, making it hard to hold a cup or turn a doorknob. Golf elbow is very much like a tennis elbow injury, but it happens in the middle part of your elbow, making it a medial epicondylitis disorder. At the same time, tennis players can also develop golfer’s elbow because they clench their fingers when holding the racquet. Unless a bone is protruding through your skin, proper diagnostics requires you to effectively explain your elbow pain before your New York City physician can develop a proper elbow tendon injury treatment plan. He needs to know when the pain first started, how often it appears, what makes if hurt worse and what gives you elbow pain relief. Arthrography, a test that allows your Manhattan doctor to see soft tissue damage to your tendons, cartilage and ligaments. The test may involve injecting contrast dye into your bloodstream to detect disease or injecting the dye directly into your elbow joint. Once the contrast is in your body, the medical team uses fluoroscopic x-rays, magnetic resonance imaging (MRI) or computed tomography (CT) scans to read the results. Bone x-rays that need a tiny dose of ionized radiation to make images of your bones. Called radiography, the process is effective for diagnosing fractures from falls and accidents, as well as a dislocated elbow injury. Radiography is the quickest technique for your NYC sports doctor to assess injuries, elbow breaks, stress fractures and elbow joint abnormalities that may have led to your injury. Do you have any questions about the elbow injuries treatment we offer in NYC? Would you like to schedule an appointment with the best rated elbow pain management doctor Febin Melepura MD of sports pain management and injuries clinic in New York? Please contact our office for consultation with the pain relief specialist in Midtown Manhattan.